Homemade bread can be dense, chewy and all around not so good. 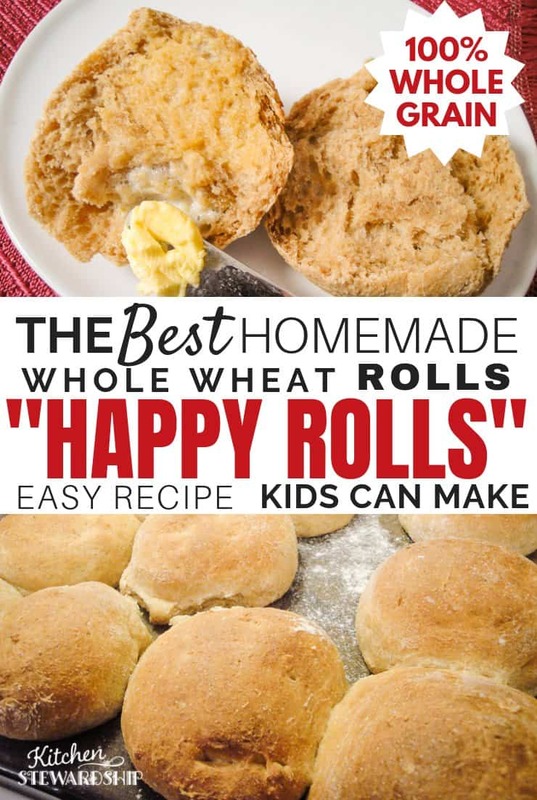 But that is definitely NOT the case with these 100% whole wheat “happy rolls.” They are soft and light. And they make the perfect pairing for my cream of potato soup. Sometimes the answer might be right under your nose. I’m pretty sure this recipe is the winner so far in my book, and it’s one I’ve made for a few years now as rolls and hamburger buns. It’s featured as THE soaked bun recipe in the Family Camping Handbook. I found it at The Happy Housewife way back when I first started blogging (at which point almost all my recipes started coming from online resources), and although it has a tiny bit of vital wheat gluten added, I’ve also found that omitting it entirely has barely an impact on the final product. The rolls definitely always got bonus points in my book for being super simple (the bread machine makes the dough) and practically failproof. Measure all the ingredients into a breadmaker and run the dough setting. With floured hands, make balls of dough the size of tangerines. Place onto an ungreased baking stone or lightly greased cookie sheet and allow to rise 45 minutes. Bake in a preheated 375F oven for 15-20 minutes. 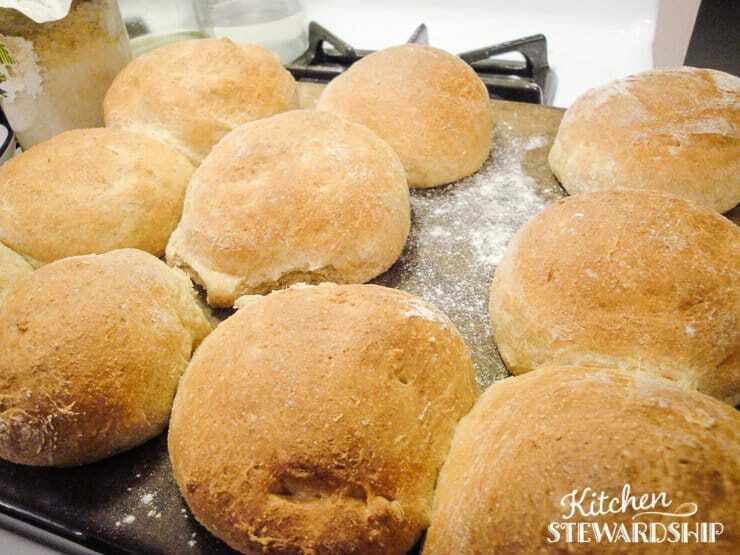 Makes about 2 dozen rolls or 12-18 buns. To bake for a loaf? I can’t believe it, but I didn’t write it down! Use 375F and, I’m guessing, somewhere between 30-45 minutes, until it sounds hollow. This is another reason why I’m way underqualified for this series! One reader recommends spreading butter on top of the finished crust, which a few people are finding to get rather brown. Shoot for a small loaf over a large one so the middle gets done! The rolls themselves, on the other hand, never fail. And really, having a recipe for delicious hamburger and hot dog buns is almost as important as a good sandwich bread anyway. Plus, if you are cooking for one or two people, rolls freeze so beautifully and can be easily pulled out one at a time. I gave my son’s kindergarten teachers these rolls for Christmas, and they both said they were hoarding them from their families! If you’d like to see how I think about baking bread, including why extra virgin olive oil is safe for baking and also how to adapt a breadmaker recipe for hand-kneading or other machines, see HERE. Don’t let this recipe go even a minute beyond the 2-hour dough cycle! The night before baking, mix together the water, oil, flour, and gluten (if using). Replace at least 1/4 cup and up to 100% of the water with whey, either from cheesemaking or yogurt cheese. If you use more than 1/4 cup of whey, add an additional 1/4 cup flour for each 1/2 cup of whey used. I usually just stir the soaking ingredients together right in the bread machine (don’t forget to put the paddle on the bottom) using a spoon. Leave the mixture to soak at room temperature overnight. A closed, unplugged breadmaker is a perfect place. When you’re ready to make the dough, add the egg, yeast, salt and honey and run the dough cycle. 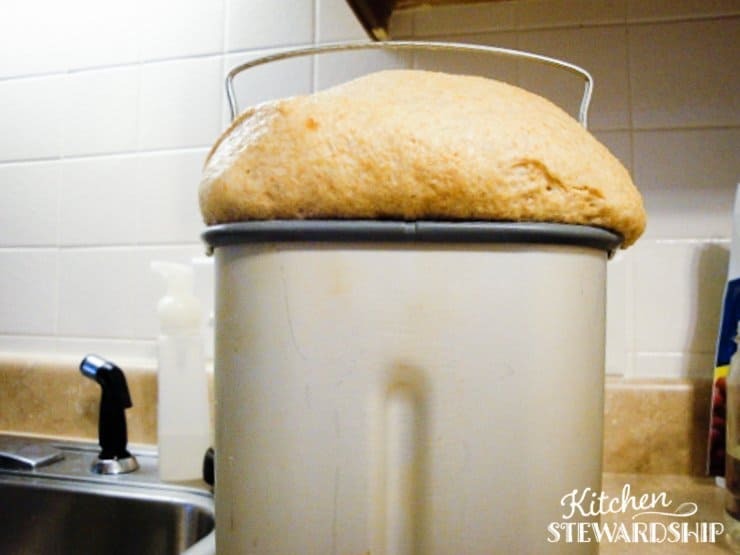 If you’re unsure about adding whey and extra flour, you can always make a visual check while the machine is kneading and toss in a bit extra if the ball of dough is not pulling away from the sides of the container sufficiently. I barely notice a difference between the soaked rolls and the unsoaked version, and it’s hardly a minute’s more work, so I highly recommend just soaking the recipe. I’d love it if you’d let me know how it goes if you give this recipe a try, especially if you use the no gluten version in a loaf pan. I’m a little concerned about the flatness, but perhaps just a titch more flour would help give the added structure needed. Be bold! Even flat loaves taste yum-o! Bread baking is a great life skill for your kids to learn. It goes right along with my Kids Cook Real Food eCourse. 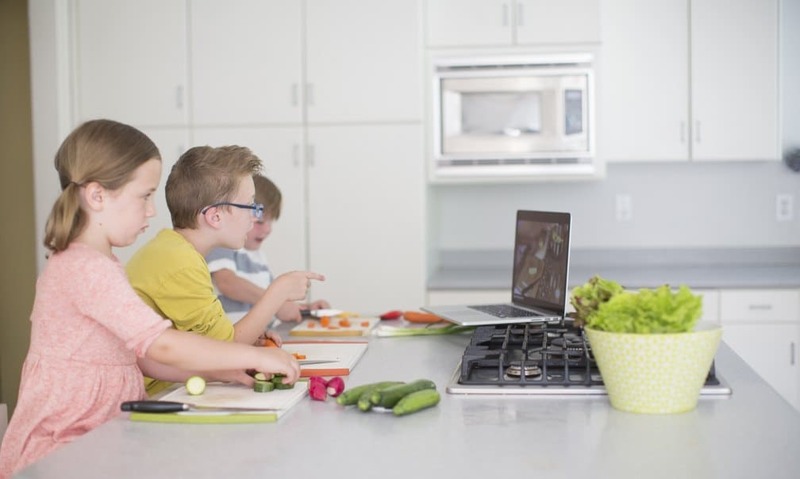 Really any way you can get your kids in the kitchen is great! Catch up on all the recipes in the Seeking the Perfect Homemade Whole Wheat Bread series. Have you seen Online Resources I Love, including the Cultured Dairy and Cheese class starting today (with ongoing enrollment)? I’d love to see more of you! Sign up for a free email subscription or grab my reader feed. You can also follow me on Twitter, get KS for Kindle, or see my Facebook Fan Page. I am going to have to try these. Thanks for sharing. Do you have any concerns about the non-stick coating on the bread machine pan? I got rid of ours because of the non-stick coating on the pan. It’s so easy to scratch and then it comes off in your food. I have seen so many references to studies that link non-stick coatings being related to Alzheimers. I know you can literally make yourself crazy with all the health warnings and concerns. (Silicone baking mats are another one I question.) However I would be interested in hearing other people’s opinions on the topic. 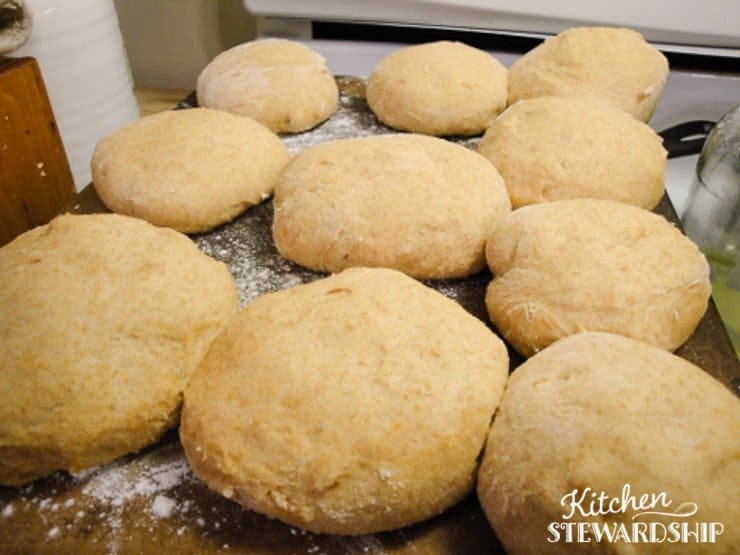 Thank you so much for including the link on how to convert the recipe to hand-kneading. I may have to add these to the menu next week. Thank you for testing all these recipes! I have a question about beans/legumes, though. 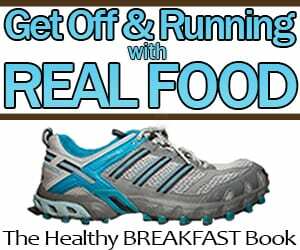 Does it matter the brand of dried beans for pinto, navy beans, etc.? I have the worst time cooking up dried beans. Mine always seem to end up mushy and the beans separate from the skin. They never turn out nice (whole, tender, & plump) like the canned ones are. This last time the bean skins were particularly hard/tough, which made them difficult to eat and not very pleasant. And pretty much all the beans separated from the skins. What am I doing wrong? Do you have any tips? I’ve just been buying the cheapest dried legumes/beans from Aldi or the grocery store. Maybe a better brand would yield a better result??? I soak my beans in water with some kefir overnight. Then I drain them & rinse them. Then I simmered them in water on the stove. Thanks for any help you can give! I really appreciate it! You probably shouldn’t soak on kefir, as it’s an acid and acids prevent beans from softening. Use plain water or add a little baking soda. Then, make sure you don’t simmer too long. A couple of hours should do it. To test if they’re done, blow on a spoonful of beans — the skins should crack and peel. Or just taste them. Don’t know if the brand matters — I get mine at Aldi too, and they usually turn out fine. Thanks for the reply! So, would I even need to add the acid at all to the beans then? Is there a site or somewhere I can go to find out the updates to the NT book? That’s a very interesting point about the rice method with beans – I haven’t seen anyone talk about it who would know if the phytic acid is reduced or not. Could I make this recipe without the bread machine? Would it be ok to just mix everything and then let it rise and bake? I’ll be trying this recipe. 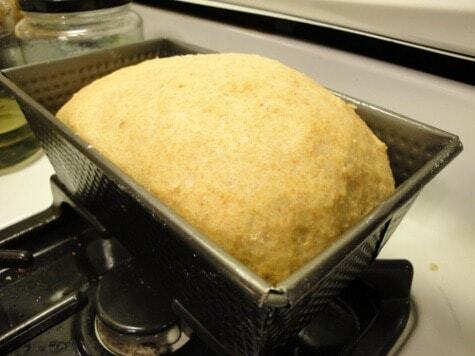 Our oven isn’t working right now – have you ever cooked it in the bread maker as well? For our normal recipe I soak overnight (the flour/water/whey/gluten and some rye) then do the rest in the bread maker in the morning. I thought I would try this recipe the same way. I haven’t had any chipping or anything with this bread maker as someone mentioned. It has crossed my mind though. Another question: If I want to freeze these would I freeze before the rise, after the rise, or after the baking (and just reheat)?? I have never baked in the breadmaker, partly b/c it’s for rolls and is really so huge in the machine, partly b/c I just don’t like the way bread machine crusts come out. I don’t know if this is the one to try there! As for freezing, I know the rolls (baked a few minutes less is best if you can reheat in the oven or toaster oven) freeze excellently. I would also try freezing the dough after the first rise but before the second, thaw in the fridge, then form rolls and allow for about 90 minutes to rise to compensate for the cold dough. Hi, I was just wondering how many loaves this makes if you use it to make bread? And if I wanted to cut the recipe in half, should I use a little more flour b/c I cant halve the egg? Thanks! This looks yummy! 🙁 I had the same question about cutting the recipe in half cause my bread machine is little and will only handle recipes with about 2 cups of flour :p. Maybe I’ll try halving an egg and report back on how it turns out ;). Okay, my promised report back. I did the soaked version overnight, then added the rest the next morning. I beat my egg really well, then poured it in a measuring cup and decided it was about 1/4 cup, so I used 2 tablespoons of it in the rolls. Since I haven’t made a full batch, I couldn’t compare, but the rolls I made came out very tasty, nice and soft inside, and the family ate them happily, so I think it worked ;). This recipe is almost exactly like the soaked recipe that I like to use, and it always turns out great. Usually I use butter or coconut oil instead of olive oil, but the rest is virtually the same. This was the first whole wheat bread that I’ve made that wasn’t hocky puck-esque. And I’m SO glad you said that about the Healthy Bread in 5 Minutes a Day. Now I don’t feel like such a failure b/c mine was always so awful! 🙂 Thanks again! I did use the gluten. I think I’ll try just reducing it next time and then if that goes well, eliminating it all together. Also, I did not soak because I did not have time. (didn’t plan ahead!) But I’ll do that next time too. Is it ok to soak in metal? My husband started stirring his sourdough starter with a plastic baby spoon because he heard that metal damages the starter. I haven’t done much soaking for baking yet. Katie, I’m going to give this a try (though as buns, not a loaf). It’s soaking right now w/ EVOO, 1.5C whey, and 5 C spelt flour. Of course. I don’t have WW of any sort. And I only have spelt b/c of your take-along spelt biscuits, lol! Anyway, will try to let you know how it goes. forgot to say: it was so-so. I wonder if the spelt, having less gluten(?) doesn’t hold its shape as well. I also soaked w/ all whey, and while I used extra flour, it was still super sticky. I should have put them in a 9×13 so they wouldn’t turn into puffy pancakes. Trying the recipe again now, still using spelt, but didn’t soak it. Also ran out of honey so using molassas. Don’t know if my comments are ever helpful as I’m constantly subbing stuff, lol. The dough was still quite sticky but I was prepared w/ well buttered hands for every other roll or so. Is the stickiness due to my using spelt rather than ww? I did put it in a 9×13 and we’ll see how they do. The rolls have risen and I’m waiting for a good hot oven now. 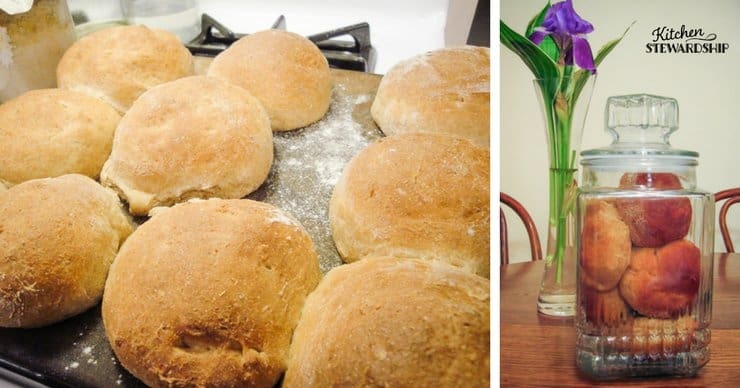 this second batch of rolls (using spelt instead of ww, and molassas instead of honey were my only 2 subs; I didn’t soak) turned out really well. still a very sticky dough, but tasty 🙂 and decently soft! thanks, Katie. Its been so long since I baked some bread. I’m going to give this one a try.Thanks for sharing the recipe and the wonderful tips too! I use a Bosch Universal mixer when I make bread, but generally make 4-5 loaves at a time. Can this recipe be doubled or tripled? If so, would I need to make any adjustments other than just doubling or 3x the ingredients? I made the bread in loaf form last night and wanted to give a report. I followed all of the ingredients (including the gluten), but I made it in a stand mixer. The dough was really sticky and never got really stretchy but maybe I need to mix longer next time? I’m new to the stand mixer. Anyway, my loaves rose great but flattened out while cooking. They looked exactly like yours in the picture, which does make me feel a little bit better. The texture of the finished bread is good, maybe a little dense but not too bad. I didn’t think the flavor was great though. I might play around with more salt or honey next time. Yeah, I decided I’d try it exactly as written first and I’m glad I did. Now I can try it w/o the gluten next. I made this yesterday in a loaf pan without the added gluten (using a stand mixer) and it turned out great! It wasn’t flat at all, and super soft. We all loved it! Can you give more details on how you did it? (see my post below). Thanks! I’m new to the stand mixer, too. But the last few times I’ve used it, I noticed that the bread comes out too crumb-y for us and would sometimes fall flat (I like it a little sturdier for sandwiches). So this time I added a little extra flour for a less-sticky dough, and let it knead much longer than before (I would say it went about 10min). Also, I made sure not to let the 2nd rise go too long. If it rises too much, it will fall while baking. So I let it just get to the top of the pan, and it rose a little more while baking but didn’t fall. I’m sure there are a lot more factors at play that I don’t know about – and I just got lucky. Its been a fun learning process! Thanks! I was thinking of adding extra flour but I didn’t know if that would make it better or worse. Think I will try 5 cups total next time. I ended up with 5 cups of flour in mine and it was great as bread or rolls. I doubled the recipe last time (soaked and kneaded only half in the breadmaker; other half in the oven overnight, greased and covered with the oven light left on) and it made 2 loaves (smallish 8-inch pans; nice round tops) and 7 large sandwich-type rolls. I am pretty sure you can use flax as an egg replacement, never tried it though. I don’t know how it would work in bread though. Just made these rolls today! Only I didn’t realize till I had started that I only had white flour. They were good with white flour too, but I’d like to make them with wheat … sure they would be more flavorful that way. I also forgot the salt! But they turned out just fine anyway. You were right; it is a forgiving recipe! This is the recipe I use to make my sandwich bread. I leave out the egg, but in the summer when I’m having trouble with the bread falling I add the egg back in, especially if I’m usuing the bread machine to knead and cook the loaf. (could be humidity or something) I do add a half cup of ground flax seed and a half cup ground oat meal for added texture and fiber. I always use 1/3 cup raw honey. I was looking for a cook humburger bun recipe so I guess I’ll just make them with my regular recipe and shape them into buns and shorten the cook time. I’m making these rolls now. How many do you usually get and are they suppose to rise covered? I never know/understand when things are supposed to rise covered or uncovered. Thanks! Mine were huge 🙂 And yummy. For the life of me I could not think how big a tangerine was (I don’t ever buy them). I thought I had made them smallish (maybe like a small orange) but they were like little mini loaves of bread LOL! 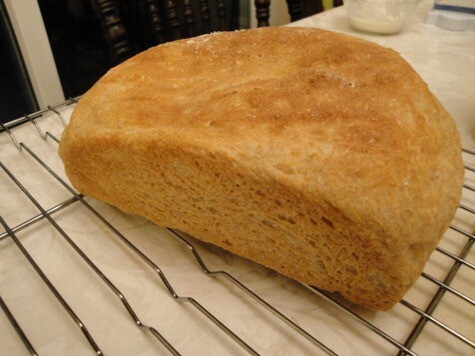 Another question about this recipe….How long do you bake the bread? I’ve got it soaking now for tonight. I assume that you put it in the loaf pan and let it rise again for about 40? And then bake for how long? I usually just let the bread machine handle the baking 🙂 But I thought I’d do it in the oven tonight for the nicer crust. I tried this yesterday. What are the directions for baking it in a loaf, dear Katie? Mine was doughy in the middle after 30 minutes at 350, and I didn’t cut into it until it had well cooled and fallen, so I didn’t think there was any rescuing it at that point. I hope the chickens enjoyed it, though. I thought I’d be wild and crazy and try using sprouted flour. I don’t remember seeing anything in the other post but I’ll go back and re-read – when you use sprouted wheat instead of regular, do you need to make any changes to a recipe? And while I’m asking questions, have you had a hard time getting sprouted wheat to go through the grain mill? Mine was fully dry, I’m pretty sure. I had to kind of stir it around and poke it a lot. Lentta, I don’t have much help, but I baked mine at 375 for 35 min and it was really brown on top, so I took it out. I tapped and it sounded hollow, but the middle was still doughy. I looked at another cook book at they suggested putting foil on top to keep it from over browning. I did try to put mine back in the oven and it must have been in there at least 50-55 min total and still wasn’t done when I finally gave up. The finished product is *just* about done and is still very edible. I can’t believe it, but I didn’t write it down! I used 375F and, I’m guessing, somewhere between 35-45 minutes, until it sounds hollow. This is another reason why I’m way underqualified for this series! Soooo sorry you wasted your time-consuming sprouted wheat on the chickens. 🙁 I haven’t ground sprouted flour often, but I don’t remember having trouble. I think it depends how long your sprouts are – others say longer sprouts can cause grinding issues. I made this bread today…super yummy…I may never try another recipe again! I used 2/3 in a loaf pan and made six large rolls. I probably could have easily gotten two nice loaves from this recipe. My loaf was bursting out of the pan and kept rising as it baked. It was a little dark on top when it was done but I brushed it with butter before it cooled and it softened the top right up (we are not a crusty family). It was so super yummy I could have eaten half the loaf. Thank goodness for a very small measure of self control! Thanks Katie! I baked the first large loaf at 375 for 15 minutes (with the rolls) and then another 15 minutes at 350. I made two loafs today (my house smells so yummy). I put both in for 30 minutes at 350 and they look good. The loaves definately get extra brown on top when done, but again brush with a bit of butter and they are not hard at all. My family loves this bread! I think it’s the first whole wheat I’ve ever made that my husband actually liked. 🙂 And the kids would eat nothing but this bread if I let them! Thank you for sharing. This is the most similar recipe to my “perfect” 100% whole wheat loaf bread- the differences are just that mine calls for milk and less honey. And it turns out just like you describe- light, soft, and flavorful. Mine is from Peter Reinhart’s Artisan Bread Every Day, which I think is far superior to Artisan Bread in 5 minutes a day. I think it is a more well rounded bread book, and there are three great 100% whole wheat recipes as well as several whole grain and seed recipes and instructions on how to adapt most recipes to some or all whole wheat. If you run out of bread recipes (haha) you should check it out. I haven’t tried to soak it yet, though (room temp soak, that is, it gets soaked a little in the fridge). I should give it a shot. 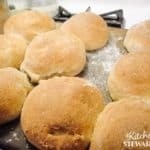 i love these rolls and would love to try baking this as bread in my Zo bread machine – anyone tried baking it in a bread machine? Can you just use plain yogurt to soak (instead of whey)? If so, how much would you use? I have found it! This is the texture i have been looking for. My husband just ate a egg/bacon sandwich on the bun and gave the thumbs up. You see, i have also been on a hunt for the perfect bread &HB bun recipe. This is truly it! I also made a loaf of bread with this batch and it looks wonderful. I did sift about 1 1/2 c of the white whole wheat( I grind) to remove a little of the germ/bran so it would be lighter. All I can say is thank you Katie and YUM!! Ok, I was running super late on time and grabbed this recipe to make… I used my mixer and mixed liquid ingredients (heated them just a little first) and yeast and then added the salt and flour. I used cups of store-bought red whole wheat flour and the rest (which was more than 3 cups!) was white flour – I tend to like a roughly 50/50 ratio. Oh I used no added gluten, so maybe that is why the extra flour?? As I say I was in a hurry, so I kneaded in the mixer, then rose for about 45 min in the microwave (yes, this is the BEST use for my microwave! it stays the perfect temp for bread rising in there!). Then punched down and made 1 big roll and two very small for my girls and the rest went into a large loaf pan – I let that rise another 20? minutes before baking. We haven’t tried the rolls yet, but the bread was awesome! Will definitely be doing this again! I’m hoping to get a grinder and some wheat soon (for my bday in a week?) and would love to try it that way. Also soaked – I haven’t soaked anything yet, but am excited to try! 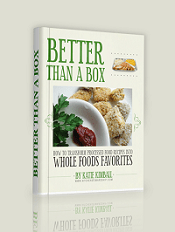 Katie – I would love to know the sequence/method of adding the additional ingredients the morning after you”ve soaked. I am alays afraid of doin that step incorrectlly. Does everything incorporate well? 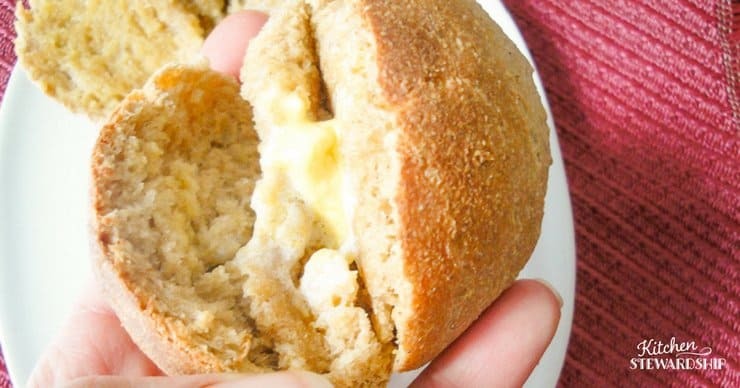 well, I have made these rolls several times now, and they are WONDERFUL! made them at my Mom’s one day to test her bread machine (she said it didn’t work…it works fine) and all she had was (ICK!) white flour. They took A LOT more flour to keep from being a batter rather than a dough. SHe says they were wonderful, but I’m not sure how white flour can be wonderful. Anyhoo! Today I’m going to attempt this as pizza crust. A little less yeast, I think. I’ll let you know if my (food police LOL) boys give it a thumbs up or not. Here goes nothing!!!!!!!!!!!! update! WONDERFUL!!!!!! The recipe (with only 2 tsp of yeast) made enough for a large pizza (bbq beef…much better than that chain place. Love love love Annie’s BBQ sauce), a small cheese pizza (for the 5 yr old), and 12 bread sticks. So YUMMY!!!! Who needs to order out? We’re gonna make this stuff at HOME! I love this recipe, it makes a great flavourful bread but I can’t seem to get it to rise. It will rise up nicely in the bread maker (or when I make it by hand) and then when I make it into rolls or a loaf and let it rise it rises up nicely. When I place it into the oven it falls flat. Am I doing something wrong? I use 100% hard red wheat (the only thing I have access too), it is my yeast, or am I doing something wrong? I let it rise in my oven with the light one and then I pull it out, warm up the oven and then bake. Should I leave it in the oven? I really love the flavour but I am really tired of flat bread (and I mean really flat bread). These turned out so perfectly! I didn’t make the sizes very standard so we’re having half the batch with our soup today and the others (bigger ones) I’ve frozen to use as sandwich/hamburger buns later. I had forgotten to soak until this morning so they only soaked for 3 hours. Does that have any benefit at all? If you don’t get to soak overnight is it better to soak at least for as long as you can, or just skip it altogether. Best bread machine recipe I’ve made so far, even if dough only. Superb rolls — thanks! So I’m new to the soaking method but so ecstatic to start trying it. If I don’t have a yogurt starter or whey, what is something that I can use that will work well with this recipe? Thanks!